The Frenchie's ears are great big dust catchers that need to be cleaned and examined weekly. When washing your Frenchie be careful not to get water and shampoo down the ear canal. Wet ears are the perfect breeding ground for bacteria and yeast causing ear infections. A gentle wipe out with a soft cloth, or if there is evidence of dirt and grime in the ear a spray with ear cleanser would be used. Care must be taken with cotton buds as they can compact wax down into the ear and damage the lining if you are not careful. We use cotton buds to clean the small crevices in the outer ear only (the erect part of the ear). Ear infections occur frequently in all dogs not just Fenchies because of the way their ears are designed. The horizontal and vertical components of a dog's ear make it difficult for particles of dirt and water to escape. Your vet will have a good ear cleanser that will dissolve the dirt and wax deep inside the ear. Easily applied by spraying liberally into the ear then massaging the cartilage in the front of the ear for around 1 minute. This will encourage the cleanser to go deep into the ear canal and dislodge the debris. You will hear a squelching sound if you are doing it properly. After the massage your Frenchie will shake the cleanser with the dissolved debris out of the ear and you can dry the ear canal with a dry soft cloth. 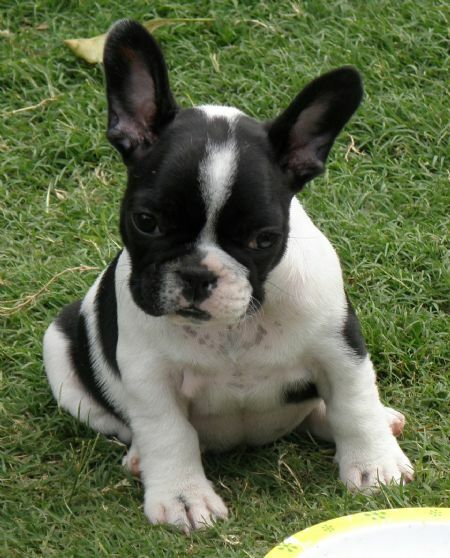 Frenchies don't have a lot of hair around the opening to the ears like other breeds. Show dogs have their ears clipped for presentation, your pets ears will be fne unclipped. * Your Frenchie is constantly and excessively shaking its' head. * There is yellow to brown discharge in your dog's ears. * Your dog's ears have a yeast-like smell. * There is redness and swelling on your Frenchie's infected ear. * Your dog is scratching at it’s ear/s constantly. Regardless of how much you take care of your Frenchie, some may have an ear infection like any dog at some stage of their life. If you have been cleaning your Frenchie's ears regulary and you notice any changes such as the above symptoms take your Frenchie to the vet for an examination and treatment asap. Your Frenchie's vet will prescribe the appropriate treatment based on what has caused your dog's ear to become infected.